The Owl A5 Large Gel System with Built-In Recirculation offers convenience and versatility. The recirculation system prevents formation of pH and ionic gradients for high resolution and uniform reproducible results. Ships complete with Buffer Chamber, Three Point Leveling Base, SuperSafe Lid with Attached Power Supply Leads, U.V. Transmissible (UVT) Gel Tray with Gasketed End Gates, 3 Combs: 16, 24, and 36 Well 1.5 mm Thick. Because the recirculation system is built right into the buffer chamber, no external pumps, tubing or stir bars are required. Part Number DAM-20. The Owl Casting Dams can be used in conjunction with several of Owl's horizontal gel casting systems. The Owl Casting Dam blocks off a portion of the UVT gel tray to allow shorter gels or gradient gels to be cast and run in one device eliminating the need for tape. 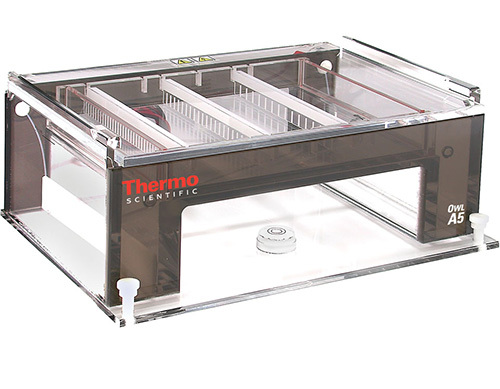 This innovative design provides a fast and easy casting method with a durable and reliable electrophoresis system. It is manufactured using a high quality aluminum that seals the agarose upon contact. A knob and finger depressions provide easy maneuverability. Because our Owl Casting Dam is free standing, the chosen length is not restricted. Part Number A2-RL-UVT. This tray has gasketed end gates with 24 slots. Part Number A2-RL-12. The tray includes 12 combs, part number A2-RL-18D. Part Number A2-RL-24. The tray includes 24 combs, part number A2-RL-18D.